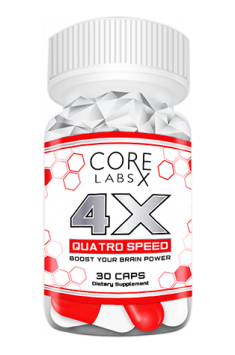 4X Quatro Speed ​​is a nootropic with a unique composition. It is one of the best preparations on the market. The composition of the product guarantees you a full harmony between high intellectual abilities and physical arousal. The supplement effectively improves mental abilities, increases work efficiency and improves the efficiency of the body. 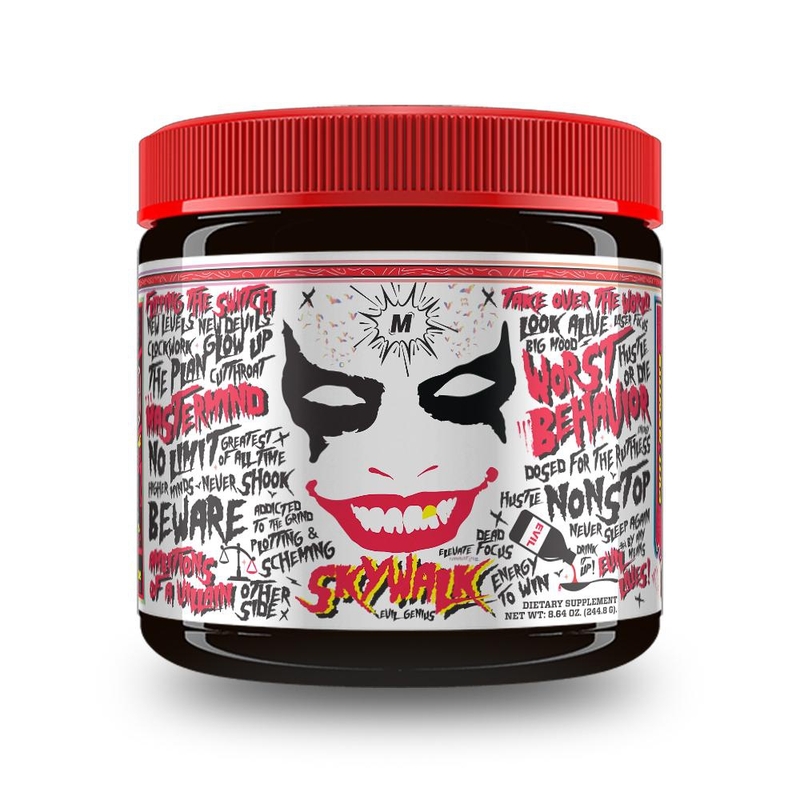 Specially selected stimulants in safe doses work together in a synergistic way, providing clarity of mind and incredible energy for action. 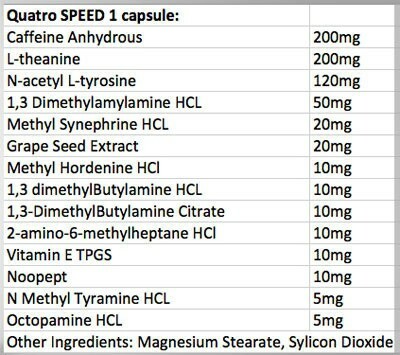 4X Quatro Load contains safe doses of stimulants for you, which thanks to the synergy of action give you incredible mental power Stimulants contained in 4X Quatro Speed ​​have different duration of action. Thanks to this, after a few hours the energy level decreases gradually, not radically. Thanks to this action you will not feel side effects in the form of weakness, palpitations or unwellness. DMAA- popular geranium is an aliphatic amine that affects the activity of neurotransmitters (including ketecholamines), providing the organism with arousal, also has a thermogenic effect. It improves the exercise capacity (strength and endurance), especially when used with the addition of caffeine and intellectual, for example, supports concentration and memory. AMP Citrate- substance is obtained as a tea extract from Pouchong, a natural stimulant with antioxidant properties. The main action of AMP-Citrate is a noticeable increase in energy, comparable to the effects of ephedrine, which until now seemed virtually impossible. AMP-Citrate works after several minutes. The flow of euphoric energy is the basic, but not the only, advantage of the product. The use of the supplement translates into a decrease in appetite and contributes to faster fat burning during training. It also increases concentration, thanks to which it becomes an ally while doing any hard work, be it physical or mental. It improves the mood, helps to focus on the goal, increases productivity and a sense of motivation. DMHA- is a stimulant that has other names such as 2-aminoisoheptane or octodrine. DMHA has a relaxant effect on the bronchi, thanks to which our aerobic capacity increases, moreover it has decongestant activity (narrowing blood vessels, causing an increase in the oxygen flow rate), does not cause "stupor" and sharpens the senses that could not always be experienced with dmaa. Anhydrous caffeine - has a thermogenic effect and suppresses appetite due to the increase in the production of adrenaline and noradrenaline. It has been proven that it causes the formation of such neurotransmitters as dopamine, acetylcholine or even serotonin in the central nervous system, which exerts a stimulating effect and increases cognitive functions. The overall activity of caffeine on the body, allows you to maintain the effectiveness of training and maintain a positive mood, despite the calorie deficit. Grape seed extract - resveratrol contained in the grapes acts as an antioxidant, scavenging free radicals that damage the healthy cells of the body. It is a substance that reduces the absorption of LDL cholesterol in the walls of blood vessels, reducing the risk of heart disease and atherosclerosis. It inhibits platelet aggregation and prevents the formation of dangerous clots. It is perceived as a substance that has properties preventing the occurrence of obesity, and may also have beneficial effects in the prevention of diabetes. In addition, it has the ability to lower blood pressure levels, which is an important factor in the prevention of lifestyle diseases. L-Theanine - is a non-protein amino acid found naturally in the leaves of green tea - camellia. It has psychoactive properties because it easily overcomes the blood-brain barrier. It stabilizes the mood, calms, relieves symptoms of stress and anxiety. Also used as a nootropic agent - improving cognitive functions, work efficiency and learning effectiveness. Researchers demonstrated the efficacy of Teanina in increasing attention, vigilance and productivity, and the effects are already visible within the first hour after administration. N-Acetyl L-Tyrosine-acetylated derivative of the L-tyrosine amino acid. Ordinary L-tyrosine is less stable and also less soluble in water, which can lead to reduced bioavailability. Acetylation increases the solubility and stability of some amino acids. N-acetyl-L-tyrosine supports brain function by supporting the synthesis of catecholamine norepinephrine and dopamine (neurotransmitters). Vitamin B6 supports the metabolism of amino acids. Vitamin B6 helps in the proper functioning of the nervous system, helps in maintaining normal psychological functions and contributes to the reduction of tiredness and fatigue. Noopept - is considered to be a nootropic agent stimulating in the area of ​​the central nervous system. Its unique properties lead to an increase in cognitive functions, improvement of memory, as well as faster assimilation of information. The compound stimulates the connection between the hemispheres of the brain. Noopept significantly contributes to the growth of creativity, efficiency and better functioning of thought processes. It is a great remedy for use during increased mental and physical activity. It has an additional protection against the harmful effects of free radicals, protecting neurons from external factors. Noopept proves to be effective in the recovery of memory, problems with emotional instability and the improvement of well-being. It is worth adding that it helps in disorders associated with insomnia and restores healthy and restful sleep. Its beneficial properties lead to the activation of mental processes, memory, intelligence, motivation and in the case of the need to focus maximum in work and study. Oktopamine - shows a thermogenic effect, thanks to which it is used for the production of slimming preparations. The use of octopamine helps to speed up metabolism and stimulates the secretion of insulin, which belongs to the group of anabolic hormones. The use of octopamine primarily promotes the release of fats from fat cells, thanks to which a faster reduction of body weight is possible. Oectamine allows you to burn excess body fat without compromising muscle mass and is therefore often used by bodybuilders during the weight reduction period. In addition, octopamine has appetite suppressing properties, which positively affects the final effects of slimming treatments. Supplementation of the relationship is recommended both for the figure-sculpting athletes and people who control body weight on a daily basis and thus striving to obtain a slim figure.